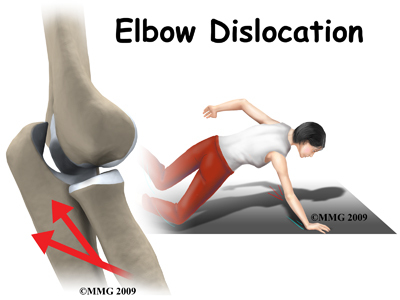 Welcome to Barkman & Smith Physical Therapy’s guide to elbow dislocation. When the joint surfaces of an elbow are forced apart, the elbow is dislocated. The elbow is the second most commonly dislocated joint in adults (after shoulder dislocations). 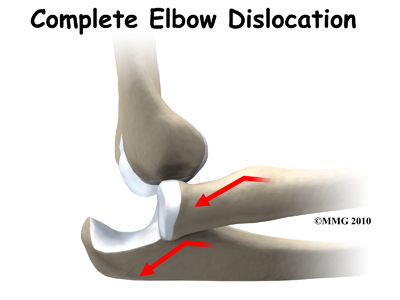 Elbow dislocations can be complete or partial. A partial dislocation is referred to as a subluxation. The amount of force needed to cause an elbow dislocation is enough to cause a bone fracture at the same time. These two injuries (fracture-dislocation) often occur together. The bones of the elbow are the humerus (the upper arm bone), the ulna (the larger bone of the forearm, on the opposite side of the thumb), and the radius (the smaller bone of the forearm on the same side as the thumb). The elbow itself is essentially a hinge joint, meaning it bends and straightens like a hinge. Most people don’t realize that there is a second joint where the end of the radius (the radial head) meets the humerus. This joint is complicated because the radius has to rotate so that you can turn your hand palm up and palm down. At the same time, it has to slide against the end of the humerus as the elbow bends and straightens. The joint is even more complex because the radius has to slide against the ulna as it rotates as well. 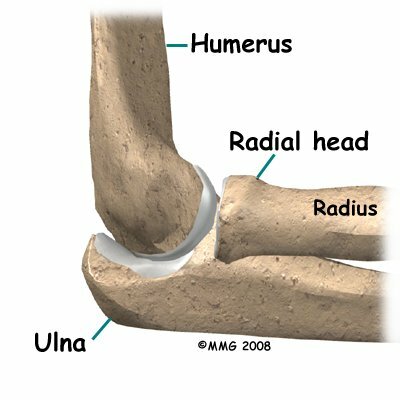 As a result, the end of the radius at the elbow is shaped like a smooth knob with a cup at the end to fit on the end of the humerus. The edges are also smooth where it glides against the ulna. 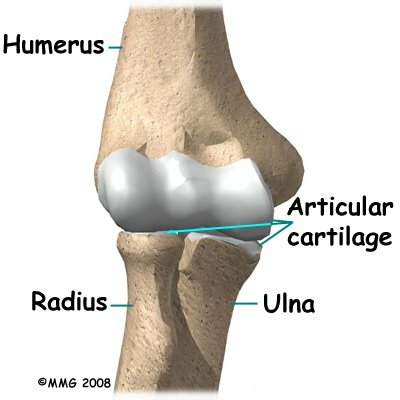 Articular cartilage is the material that covers the ends of the bones in a joint. Articular cartilage can be up to one-quarter of an inch thick in the large, weight-bearing joints. It is a bit thinner in joints such as the elbow, which don't support weight. Articular cartilage is white, shiny, and has a rubbery consistency. It is slippery, which allows the joint surfaces to slide against one another without causing any damage. In the elbow, articular cartilage covers the end of the humerus, the end of the radius, and the end of the ulna. There are several important ligaments in the elbow. Ligaments are soft tissue structures that connect bones to bones and are the main anatomical feature that creates stability in a joint. 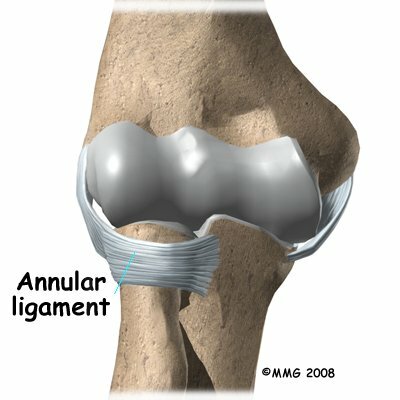 The ligaments around a joint usually combine together to form a joint capsule. A joint capsule is a watertight sac that surrounds a joint and contains lubricating fluid called synovial fluid. 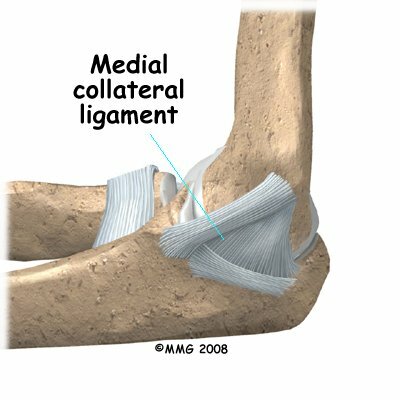 In the elbow, two of the most important ligaments are the medial collateral ligament (MCL) and the lateral collateral ligament (LCL). 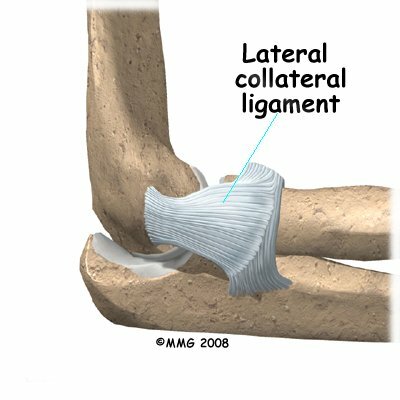 The MCL of the elbow is on the inside edge, and the LCL is on the outside edge. Together these two ligaments connect the humerus to the ulna and keep it tightly in place as it slides through the groove at the end of the humerus and bends the elbow. These ligaments are the main source of stability for the elbow. They can be torn when there is an injury to or dislocation of the elbow. If they do not heal correctly the elbow can be too loose, or unstable. There is also another important ligament called the annular ligament that wraps around the radial head and holds it tight against the ulna. The word annular means ring-shaped. The annular ligament forms a ring around the radial head as it holds it in place. This ligament can be torn when the entire elbow or just the radial head is dislocated. Elbow dislocation is usually the result of trauma. The most common trauma resulting in an elbow dislocation is a fall onto an outstretched arm and hand. For example, if you are pushed over you naturally try to break your fall by putting your hand out onto the ground. When the hand hits the ground, the force is transmitted through the forearm to the elbow. This force pushes the elbow out of its socket. This injury can also result in a fracture-dislocation. About half of all elbow dislocations in teens and young adults occur as a result of a sports activity. Commonly elbow dislocations are associated with sports such as gymnastics, cycling, roller-blading, or skateboarding, but any sport where you have the potential to fall and consequently put your hand out to stop you can result in an elbow dislocation. 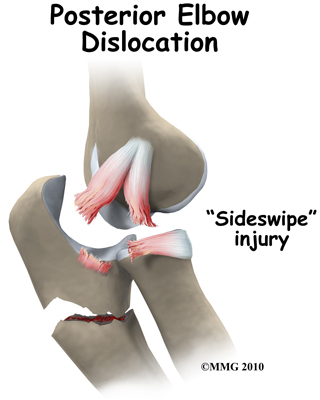 An elbow dislocation can also occur from a sideswipe injury. This type of injury occurs when the driver of an automobile has the elbow out the open window during a car accident. 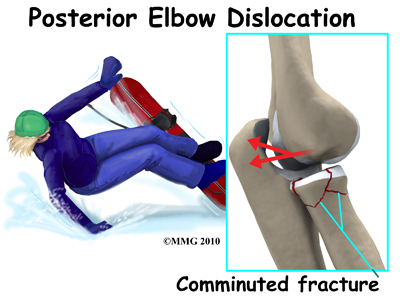 The force of the impact causes a severe fracture-dislocation of the elbow. If the elbow is fully dislocated, it will look out of joint. There may be dimples or indentations of the skin over the dislocation where the bones have shifted position. Pain can be intense until the arm is relocated. The pain is often significantly relieved immediately after the joint is put back in place but there will be residual tenderness around the joint. There will be some swelling and bruising around the elbow; the exact amount depends on how badly the soft tissues around the joint have been damaged or if there was also a fracture. Bruising is often not immediately obvious but appears several days after the injury. 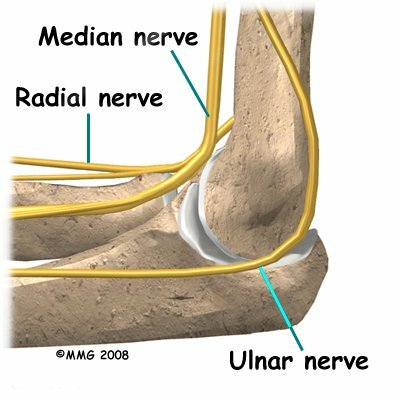 Injury to any of the three nerves that cross the elbow (median, ulnar, or radial nerves) can cause neurologic symptoms such as numbness, tingling, and/or weakness of the forearm, wrist, and hand. If a bone fracture is also involved the fracture can cut or damage a nerve causing temporary or permanent paralysis. Pain and an inability to straighten the elbow or pain when turning the palm up (supination) is typical. There is often tenderness along the lateral aspect of the elbow (side of the elbow away from the body). How do health care professionals diagnose this condition? The history and physical examination are probably the most important tools the health care professional uses to guide his or her diagnosis. As mentioned, a traumatic event has generally occurred to cause this injury. Moving the elbow both passively and actively is often very limited and painful, especially extension and supination. The health care professional will check for any signs of injury to the nerves or blood vessels and will observe for any signs of the dislocation such as the dimpling of the skin. X-ray is the best way to confirm a dislocation or fracture-dislocation. After the elbow is relocated it is important to get an X-ray in order to determine if there has been a fracture from the dislocation itself or sometimes from the process of putting it back into place (relocating the joint.) Other imaging studies may be ordered to look for damage to the joint cartilage, bone, ligaments, and other soft tissues. If bone detail is difficult to identify on an X-ray, a computed tomography (CT) scan may be done. If it is important to evaluate the ligaments, a magnetic resonance image (MRI) can be helpful. It is possible for the elbow to relocate by itself. This is more likely when there is a subluxation, rather than a complete dislocation. Sometimes a trained medical person can reduce the elbow by applying a quick motion to the forearm. There are several different methods used for manual (closed) reduction. 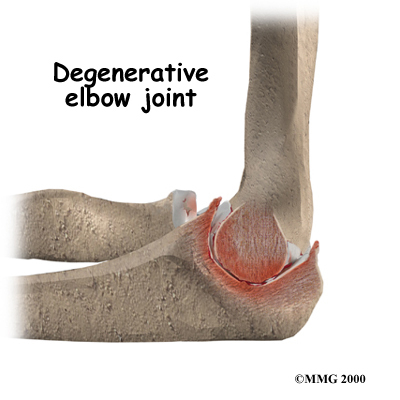 Closed reduction refers to the fact that the elbow can be put back in joint without surgery. An open incision is not needed. As the bones can be fractured and the soft tissue damaged from the relocation process itself, it is extremely important that this is done by a trained medical professional in order to avoid or minimize further injury. Manual reduction can be done in an emergency on site (e.g., at an athletic event or car accident) but usually the procedure is done in a clinic or hospital setting where you can be given medications first to help with the pain, and X-rays can be obtained immediately afterwards. After suffering from an elbow dislocation that does not require surgery, your arm may be immobilized for 10 to 14 days to allow the ligaments to heal. Intermittent gentle range of motion (ROM) and basic muscle tightening exercises (isometric exercises) with your arm out of the sling may be allowed during this time but you should rely on your physician to advise you whether this is suitable in your case. The type of activities and movements allowed are determined according to the extent of injury that is present. Physical Therapy at Barkman & Smith Physical Therapy can begin as soon as you are allowed to start ROM exercises or as soon as your doctor advises it. When the sling is removed, you will experience some pain when you start to move your elbow and forearm. This pain is from not using the joints regularly over the period of immobilization and also commonly from concurrent soft tissue injury that occurred when you dislocated your elbow. Your therapist will assess how much soft tissue injury is present by testing the stability of your ligaments as your elbow tolerates it. Unfortunately with a lot of ligament damage, your elbow is at risk of frequently dislocating or being unstable. If a lot of scar tissue builds up, however, the elbow will become too stiff and this affects the normal functioning of the joint. The elbow joint is particularly sensitive to injury and easily becomes stiff. Your treatment at Barkman & Smith Physical Therapy will focus initially on relieving any pain or swelling you may have. Your therapist may use modalities such as heat, ice, ultrasound, or electrical current to assist with decreasing any pain or swelling you have around your elbow or anywhere along the forearm, at the shoulder, or into your hand. Your therapist may also use massage for your neck, shoulder, elbow, forearm, or wrist to improve circulation, assist with the pain, and make moving the entire upper extremity easier. The next part of our treatment will focus on regaining the ROM, strength, and overall function of your elbow. Most elbows are stiff after a period of immobilization, but one of the main goals of immobilizing the elbow is to allow the ligaments to heal as scar tissue forms. With scar tissue in place the joint regains some of its stability, but stiffness is to be expected. If you have also lost ROM in your wrist, hand, or shoulder due to the period of immobilization or due a concurrent injury, exercises will also be prescribed for these joints. If your elbow is particularly stiff, your therapist may suggest you work on the range of motion in a pool where the water properties of warmth, buoyancy, and hydrostatic pressure often make it easier and less painful to move your joint. Your Physical Therapist at Barkman & Smith Physical Therapy will prescribe a series of stretching and strengthening exercises that you will practice in the clinic and also learn to do as part of a home exercise program. These exercises may include the use of light weights or exercise tubing to add resistance for your elbow, wrist and shoulder. Soft balls or gripping devices may be used to encourage the return of your grip strength. Regularly measuring your grip strength with a hand-held dynamometer will be one of the ways we determine the progress of your rehabilitation at Barkman & Smith Physical Therapy. If necessary, your Physical Therapist will mobilize your joints. This hands-on technique encourages the stiff joints of your elbow, and wrist or shoulder (if necessary) to move gradually into their normal ROM. Early mobilization and ROM exercises are particularly important in the rehabilitation of the elbow. Without these types of exercises an elbow that has been dislocated can quickly become too stiff and lose important ROM, which may be difficult to gain back over a longer period of time. Regaining the ability to bend your elbow and rotate your forearm is crucial in order to be able to do simple daily activities such as bringing food to your mouth or to hold change in your hand. Regaining elbow extension (straightening), while also important, is not as crucial to the activities of daily living in comparison to elbow flexion. In other words, losing some straightening of the elbow due to stiffness following an elbow dislocation will not affect your everyday function as much as the loss of a lot of elbow flexion. That being said, for those participating in sport, loss of any elbow extension can be extremely detrimental to the functioning of their upper limb and can severely limit them in their sport. For this reason, the return of full elbow range of motion, in any situation, is one of the goals of Physical Therapy at Barkman & Smith Physical Therapy. Your therapist will keep a close watch on the improvements in your ability to bend and straighten your elbow as well as rotate your forearm by measuring these angles repeatedly over the course of your rehabilitation. As a result of any injury, the receptors in your joints and ligaments that assist with proprioception (the ability to know where your body is without looking at it) decline in function. A period of immobility will add to this decline. Even an activity such as assisting yourself with your arms to get out of a chair, pulling a glass from a cupboard, or pushing a door open requires weight to be transmitted through your elbow and for your body to be proprioceptively aware of your limb. If you are an athlete, then proprioception of your upper extremity is paramount in returning you to your sport after an elbow dislocation. For this reason proprioceptive exercises will be an important part of your rehabilitation program at Barkman & Smith Physical Therapy. Proprioceptive exercises might include activities such as rolling a ball on a surface with your hand, holding a weight up overhead while bending and straightening your elbow, or push-ups on an unstable surface. Advanced exercises may include activities such as throwing or catching a ball. For athletes we will encourage exercises that mimic the quick motions of the sports or activities that you participate in. Proprioceptive exercises for the shoulder blade may also be included, as this area of the upper extremity needs to be well controlled in order for the elbow to function optimally. The shoulder area is the elbow’s connection to the torso and creates a stable base for the elbow to work from. For this reason maximum control of the shoulder is extremely important in order to optimize your elbow function. If your elbow dislocation results in an elbow that is too loose, or unstable, rehabilitation will focus even more around controlling the elbow joint using the muscles around the elbow and the shoulder. Very extensive and advanced proprioceptive exercises will be prescribed along with several strengthening exercises. Taping and bracing (as discussed below) can assist with keeping the joint stable. Your therapist will educate you on common activities that can re-dislocate your elbow, and these activities should be strictly avoided. Minor to moderate laxity can usually be well controlled with Physical Therapy. Severe laxity will likely require surgical intervention. In addition to specific exercises for your elbow and upper limb, we highly recommend maintaining the rest of your body’s fitness with regular exercise while you rehabilitate your elbow. Maintaining general cardiovascular fitness can be done with lower extremity fitness activities such as walking or using a stationary bike or stepper machine. Weights for your other arm or lower extremities can also be done but you may require a friend to assist you in the gym as no weight should be lifted by your injured elbow until the tissues have had a chance to heal, and your therapist allows it. In fact, while your elbow is healing it is best to avoid any further traction on it at all. Pulling a door open, carrying a heavy purse in the crux of your elbow, or lifting a weighted backpack are a few examples of activities and movements that put a traction force through the elbow. Your therapist may use these traction-type activities as your therapy advances in order to strengthen your elbow and prepare it for everyday use. Early on, however, it is best to avoid them. Your therapist will add graduated heavier exercises and endurance work as soon as your elbow can tolerate it. Following the strict advice of your therapist when adding or advancing exercises is necessary as it is crucial to ensure these stresses can be withstood by the elbow before returning to any heavy work duties or sporting activities. Some athletes or workers with manual jobs continue to wear a protective splint and/or use taping to stabilize the joint during the transition back into action. A brace or tape can help protect the joint during motion and activity and can add to the proprioceptive control you feel around your joint. Your Physical Therapist can educate you on which type of brace would be best for you and can tape your elbow to simulate a brace before you buy one, or instead of buying one. Generally, elbow dislocations respond extremely well to the Physical Therapy we provide at Barkman & Smith Physical Therapy. Simple elbow dislocations generally heal well with few (if any) problems. Unfortunately however, a consequence of an elbow dislocation is that osteoarthritis of the joint can occur years down the track. With uncomplicated elbow dislocations that do not require surgery most athletes can resume some sports participation three to six weeks after the injury. The timing of return to work and sport depends on the type of work or sport (e.g., throwing sports or heavy labourers may require a longer rehab). In addition, dislocation of the dominant hand may require longer rehab before full motion and strength are restored. Most dislocations without a fracture can be reduced without surgery however in a few cases surgery may be needed for reduction. Surgery is often required in order to restore alignment and function if there has been a fracture or there has been severe damage to the ligaments, which would result in the joint being unstable and recurrently dislocating. The type of surgery depends on the extent of the damage. Wires, pins, or even an external fixation device may be needed to hold everything together until healing occurs. If there is too much swelling, it may be necessary to delay surgery for a few days or even up to a week. In these cases the elbow will be reduced right away and the arm immobilized while waiting for the swelling to subside. Post-operative immobilization is usually required following surgery for an elbow dislocation, especially for complex injuries. A cast, dynamic splint, or a postoperative ROM brace can be used for immobilization. The adjustable ROM brace is used to improve elbow motion gradually while allowing soft tissue healing. It helps minimize scar tissue formation and may contribute to fewer complications (such as arthritis) later on. While immobilized, simple shoulder, hand and finger exercises will likely be the only exercises you are allowed to do. If your wrist is not fully immobilized, gentle bending, rotation, and gripping exercises will be encouraged. You may be allowed to do muscles tightening exercises while immobilized (isometric exercises.) A Physical Therapist at the hospital will teach these exercises to you and they should be strictly abided by. After the period of immobilization, Physical Therapy at Barkman & Smith Physical Therapy should begin as soon as your surgeon recommends it. With fractures, normal bone healing occurs around the 4-6 week mark so often therapy is recommended at that point. Each surgeon will set his or her own specific restrictions based on what was done during surgery, personal experience, and whether the elbow is healing as expected. Even if extensive Physical Therapy for your elbow does not begin immediately, at Barkman & Smith Physical Therapy we highly recommend maintaining the rest of your body’s fitness with regular exercise. During the period of immobilization maintaining general cardiovascular fitness can be done with lower extremity fitness activities such as walking or using a stationary bike or stepper machine. Weights or weight machines for your lower extremity and opposite arm are also acceptable to use as long as the restrictions regarding your healing elbow are strictly abided by. Generally, lifting even light weights with your surgically repaired limb will not be allowed and will be difficult as your elbow heals so you may require a friend to assist you with your weights setup if you are keen to continue while your joint heals. Your Physical Therapist at Barkman & Smith Physical Therapy can discuss the most appropriate way for you to maintain your fitness as well as provide a general fitness program specific to your needs while abiding by your surgeon’s restrictions. Once the period of immobilization is over, you will experience some pain when you start to move your elbow and forearm, and possibly even when you move your wrist or shoulder. This pain is from not using the elbow regularly and the surgical process itself, but may also be from concurrent soft tissue injury that occurred when you dislocated your elbow. Your Physical Therapist at Barkman & Smith Physical Therapy will focus initially on relieving your pain and decreasing inflammation. They may use modalities such as heat, ice, ultrasound, or electrical current to assist with decreasing any pain or inflammation around the surgical incision, along the forearm, or into the shoulder or hand. They may also use massage for the neck, shoulder, elbow, forearm, or wrist to improve circulation, assist with the pain, and make moving the entire upper extremity easier. As the elbow tolerates it, rehabilitation will follow along similar lines of that listed under non-surgical rehabilitation. Exercises to improve and regain ROM, strength, endurance, and proprioception will be prescribed as part of the exercise program you will do in the clinic and as part of your home exercise program. These exercises will be advanced as your elbow heals in order to ensure that your elbow is improving as quickly as it can and that you can return to your work and recreation activities as soon as possible. As mentioned under non-surgical treatment, some patients continue to wear a protective splint and/or use taping to stabilize the joint during the transition back into work or sport. This is common practice as well after surgical treatment. A brace or tape can help protect the joint during motion and add to the proprioceptive control you feel around your joint as you ease back into your normal activities. Your therapist will advise you on whether a brace or taping would be helpful in your situation. Also mentioned under non-surgical rehabilitation, some ROM of the elbow may be lost after this type of injury. This is true even with surgical intervention. Often due to the surgical process scar tissue builds up and causes the elbow to stiffen. To minimize the amount of ROM lost post-surgically, your therapist will mobilize your elbow joint. This hands on treatment assists your elbow (and wrist if needed), to move into the normal ROM. Unfortunately, despite best efforts by the surgeon and your therapist, it is common for some range of motion to be lost either with bending or straightening (or both) of the elbow. Sometimes rotation of your forearm (supination) can also be mildly limited. As long as most of the range of motion has returned, most patients are not limited in everyday activities by the loss of ROM. Obviously with high-level sports however, any limitations in ROM can be more of a problem and may affect the ability to return to pre-injury status. Some elbows, even after surgery, can remain unstable and continue to dislocate. If the elbow recurrently dislocates (or becomes too stiff) additional reconstructive surgery may be needed. Again, for some patients, arthritis is a long-term result of elbow injury and this is more likely if there is a history of recurrent elbow dislocations. Fortunately most elbow dislocations, whether treated non-surgically or surgically, do very well with the rehabilitation we provide at Barkman & Smith Physical Therapy. If, however, during rehabilitation your pain continues longer than it should or therapy is not progressing as your Physical Therapist at Barkman & Smith Physical Therapy would expect, we will ask you to follow-up with your doctor or surgeon to confirm that your elbow is tolerating the rehabilitation well and to ensure that if you have had surgery, there are no hardware issues that may be impeding your recovery.